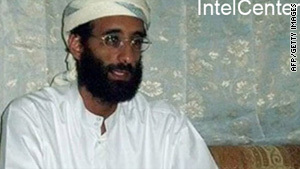 A still image released by IntelCenter in 2009 shows fugitive U.S-born cleric Anwar al-Awlaki. (CNN) -- Fugitive American-born cleric Anwar al-Awlaki warned of new attacks on Americans at home and abroad in a new video released over the weekend. Anwar al-Awlaki, who is believed to be hiding in Yemen, accused U.S. forces of deliberately killing women and children in Iraq and Afghanistan. And he praised Maj. Nidal Hasan, the U.S. Army psychiatrist charged in the November massacre at Fort Hood, Texas, calling him "one of my students." "Oh, America, if you transgress against us, we will transgress against you, and you keep killing our people, we will kill your people," Anwar al-Awlaki says in the video. "This is the image that we need to present. These American soldiers heading to Afghanistan and Iraq will be killed. We will kill them if we can, there in Fort Hood, or we will kill them in Afghanistan and Iraq." U.S. authorities also have linked al-Awlaki to the failed attempt to blow up a U.S.-bound jetliner in December, and he is on the list of suspected al Qaeda leaders targeted for capture or assassination. White House spokesman Robert Gibbs on Sunday said al-Awlaki "supports al Qaeda's agenda of murder and violence." "We are actively trying to find him and many others throughout the world that seek to do our country and to do our interests great harm," Gibbs told CBS' "Face the Nation." Al-Awlaki was among the reported targets of a December airstrike in Yemen, which al-Awlaki has alleged was carried out by U.S. aircraft. But in the video, he says, "I move freely in Yemen." "There is a support among my tribesmen," he said. "Even though they know they are in danger, they welcome me and greet me because they are righteous people." He added, "If the Americans want me, let them come and look for me and God will protect me." An excerpt from the interview-style video had been released in April. The entire video was posted Sunday on radical Islamist Web sites that have carried similar statements in the past. In it, al-Awlaki said U.S. wars in Iraq and Afghanistan and American support for Israel were part of a broader American war against Islam, which he said the United States wants to replace with a "bogus" Islam. He praised Hasan, who is accused of killing 13 people in a rampage at the largest U.S. Army post, and urged other Muslim troops to follow his example. And he said Umar Farouk AbdulMutallab, the suspect in the failed Christmas Day plot to bomb a Northwest Airlines flight, succeeded in "even though it didn't cause the killing of one single person." "They spent more than $40 billion, and a mujahed like Omar Farouq was able to infiltrate their security apparatus even though they claim he was under surveillance," he said. "And despite all he managed to get there and reach the American heartland, to Detroit." More than 10,000 Arab-Americans serve in the U.S. armed forces, according to the Association of Patriotic Arab Americans in Military. In a statement issued in response to the video, the group said it does not "condone nor give any credibility to the statements of Anwar al-Awlaki." "We will not let their memory and the memory of the countless thousands of our fellow Americans who also gave their lives in defense of our country to be minimized or impugned by statements such as those by Anwar al-Awlaki, or tragic actions such as those of Major Nidal Hassan," the group said.